Each year, families and their favorite canines gather together on the 2nd Saturday in October to enjoy great food, music and furry fun for Beaumont Main Street&apos;s Dogtober Fest! 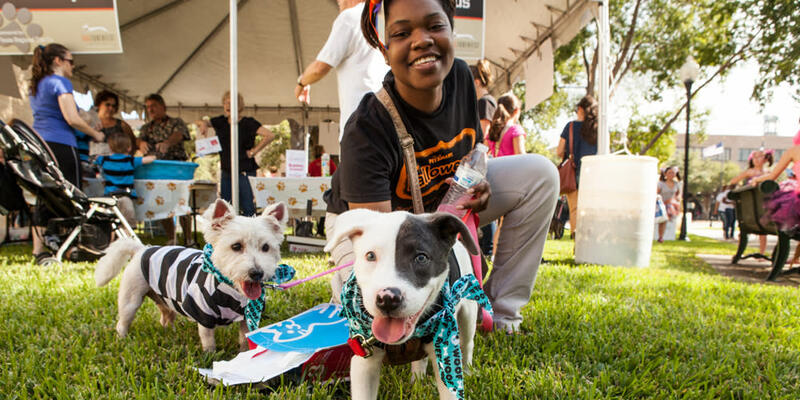 Included in the festivities are a Strut Your Mutt Competition, PAW Readings, Puppy Kissing Booth, PAW-traitures and other dog-themed activities. Dog paraphernalia is available for purchase from local vendors and awards are given throughout the day for Master/Dog Look Alike, Best Dressed Dog, Cutest Dog, Best Tail Waggin&apos;, Most Talented Dog and many others. View the full schedule for Dogtober Fest. Beaumont also has plenty of pet friendly hotels to accommodate your four-legged friend(s) and extensive list of City Parks and outdoor activities sure to keep you and the family busy while in town. If you want to bring along your four-legged friend when visiting Beaumont, you can! Beaumont is proud to be a pet-friendly city. Headed into Beaumont with your favorite four-legged friend? To help, we've compiled a list of dog-friendly restaurants.